While I am NOT a stamp dealer, even as a collector I end up with various spare stamps, which I will be offering below. In addition to certain individual stamps from St. Vincent, I also have bundles of USA & Foreign that stamps, see below for details. Don't finalize until you are truly done (simply because PayPal charges me for every transaction). Stamps will be sold in in sets of 50 stamps (please DO NOT request individual stamps or topics) as follows. Stamps are only 9¢ each plus postage! 50 USA Commemoratives (mostly from the 1930's to 1990's). This will be ONLY commemoratives, no definitive stamps will be included. 50 Worldwide stamps (contains NO USA stamps). 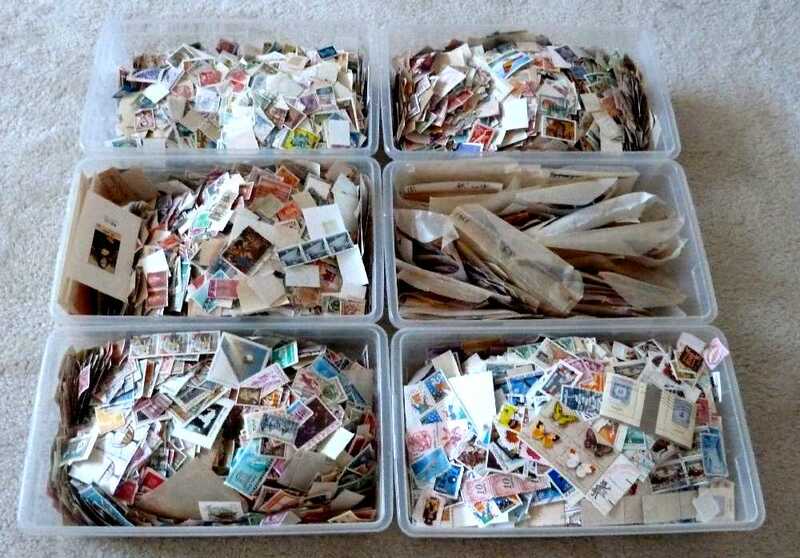 This will include old & recent stamps, mint, used, commemoratives & some (but not many) definitives.
. The order will NOT be finalized until you click on this button. Please choose the correct button above. If selecting "USA shipments" and your address is not in the USA, then I will return the payment. I prefer PayPal payments, but you can submit cash payments by mail (at your own risk). I can accept US Dollars, Euro coins & banknotes & Swiss Franc coins & banknotes. Prices are the same in all currencies (ie: US$ 1.00 = 1 Euro = 1 Swiss Franc). I only accept Euros & Swiss Francs since these are currencies that I can trade with other people. Due to the low price of my offering, the shipping & handling costs include postage, the envelope and my PayPal receiving fee. All items will be mailed via regular 1st class or airmail. If need insurance and/or registration, then these fees are extra. Note: You are welcome to order more than one of each above, but please remember that when you order more than one set, that there might be duplicates. I will simply start counting stamps out of the box and will not check to see if there are duplicates. Please indicate which and how many of the stamps you are ordering (ie: 2x USA sets, 1x Worldwide sets, etc). Please secure coins & bills in the envelope, use extra paper so that you can not see through the envelope. Send exact amount; I can NOT send back change! $5 per set for US shipments, $6 per set for Foreign shipments. Use commemorative stamps on your envelope! As a collector, it is only common courtesy to use commemorative stamps when sending mail to a fellow collector; I use commemorative stamps on all outgoing mail, please do the same!